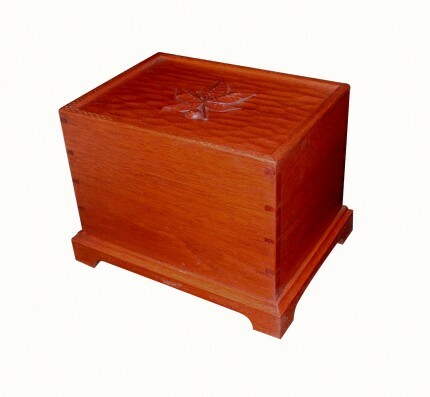 A burial box carved in black cherry for cremated remains. The box is constructed with dovetailed corners, a molded base, panel top and has a removable bottom panel. I have made some that have only a textured top panel and some like the one shown that have a personalized symbol, in this case a life long Ohio Buck Eye fan. I recognize that planning ahead for an item like this is not possible in every situation. I have made a two day turnaround for one of these boxes in the past as I did have the available time and shop space, it doesn’t always work out that way. I make these boxes with my heart. The cost is $500.00 and up with the personalization considered.